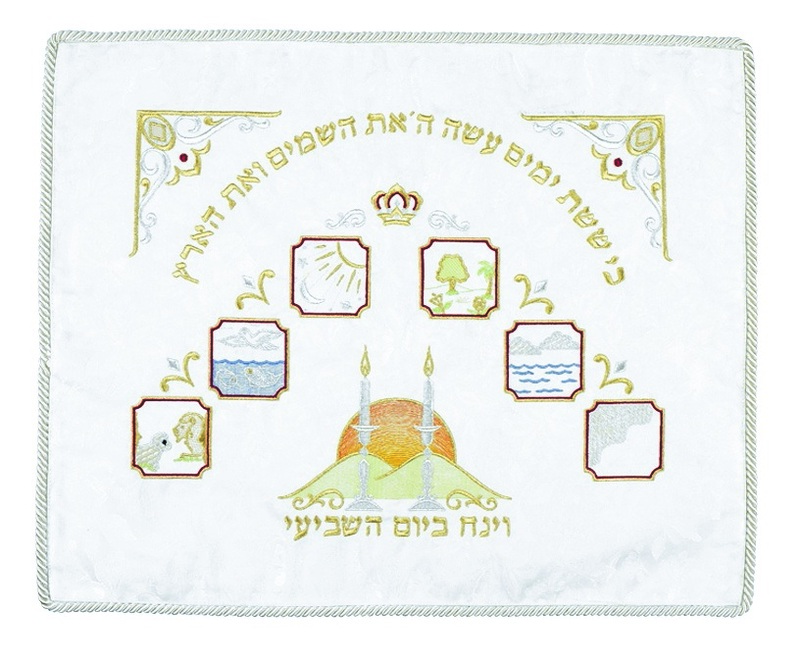 Made of elegant designed heavy brocade fabric, this challah cover illustrates the individual first six days which God created the world and on the Seventh Day, Shabbat, He rested from the all the work. The design consists of six boxes, each representing, with a picture, what God created on that individual day. Above the design the Hebrew words “Ki sheshet yamim Hashem et hashamaim ve'et ha'aretz”, which translates, “That for six days the God created the heavens and the earth” are embroidered acroos the top. In the center the image, mountains with a setting sun and a pair of lit candlesticks are arranged, symbolizing the coming of Shabbat. The continuation of the verse continues below the image portraying the Shabbat, in Hebrew words “Uvayom hashvi'i Shavat vayinafash” which translates, “And on the seventh day, He rested and was refreshed”. The edge of the challah cover is bordered by an elegant rope trimming.